Thread in 'Research & Development' started by KrossX, 23 Dec 2017. 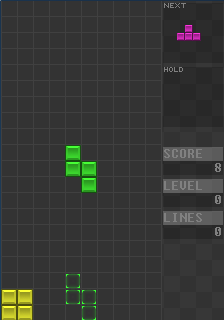 I made a tetris game a long time ago but it was very barebones. Lately I've been working on improving it a bit with textures, sound, text, animations, etc. I don't know if there's much of a point in yet another tetris clone but give it a try if you have the time. It requires Windows 98 or newer, OpengGL 1.1 or better, a sound device and some of HDD space. What games modes does it have? Is there anything that makes this clone different from other Tetris games out there? Do you have any screenshots? It's pretty barebones, no modes and not even a gameover screen. It's mostly the result of seeing if I could make a tetris game. I added a screenshot, though I don't know if that helps much. I'll be using that as a base to possibly improve later on with proper rotation system implementations, a menu to select these and other settings and possibly a replay system.